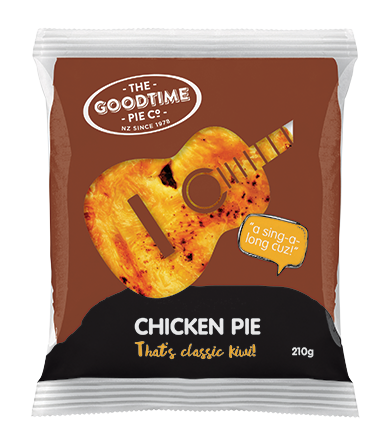 Our Classic Kiwi range of pies is the first range The Goodtime Pie Co started baking way back in 1978. If you love pies and all things Kiwi then this is the range for you. 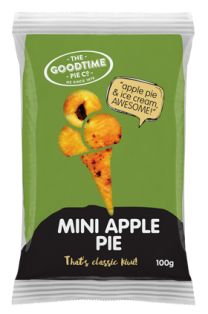 During the war our Grandad Gordon made pies for the hungry American soldiers stationed in Wellington. They sure had a few tales to tell. 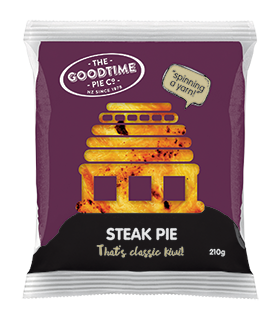 Things haven’t changed much in the capital – except now it’s our MPs who enjoy “spinning a yarn” as they tuck into a Steak Pie. Kiwis love “a day at the cricket”. 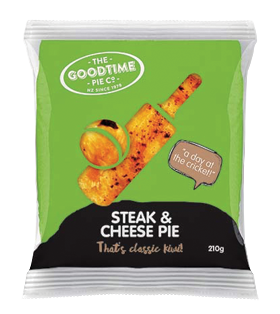 A few hours off work, the sun on your back, a hot Steak and Cheese Pie in your hand and giving the Aussies an earful for their dodgy underarm action. You can’t go hunting in a Suzuki Swift. 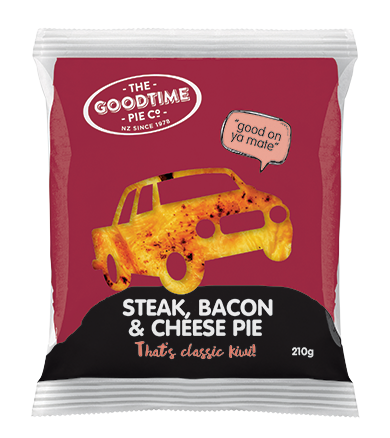 You’re going to need a real 4WD – something big enough to hold a deckload of Steak, Bacon & Cheese Pies on the way out, and the deer that you didn’t actually shoot but accidentally ran over on the drive back home. 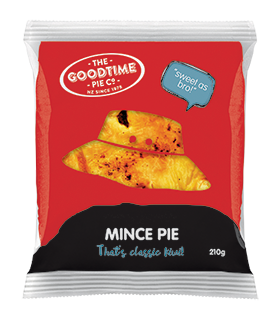 Never come home empty handed, eh?… “good on ya mate”. 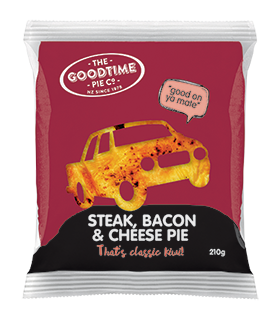 It’s Friday night and we’re “off to the wop-wops!”. 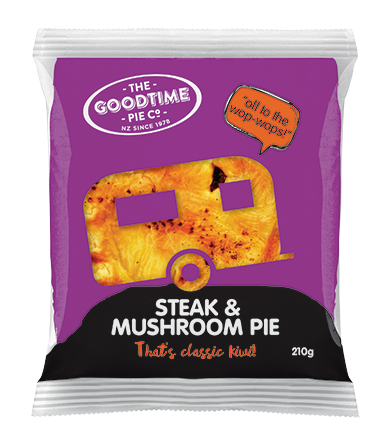 A toothbrush, jandals, a pair of togs and a caravan loaded with good old Steak and Mushroom Pies is pretty much all you’ll need to see you through the weekend. Get away from it all. 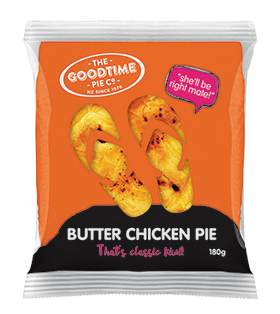 Gumboots, stubbies, singlet, bucket hat… that’s your classic Kiwi cocky. 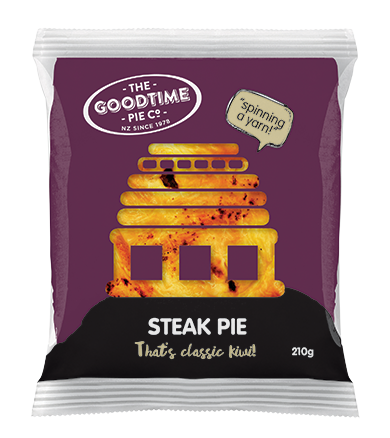 Shearing a sheep with one hand, holding a steaming Mince Pie in the other, all while watching the ABs on the TV and changing a flat on the old Massey…“sweet as bro”. 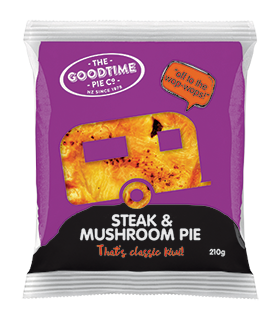 We were the first to add cheese to a meat pie in New Zealand. We had a lightbulb moment and thought it would be “a choice idea”, and obviously so did you, because Mince and Cheese is now New Zealand’s No.1 selling pie. 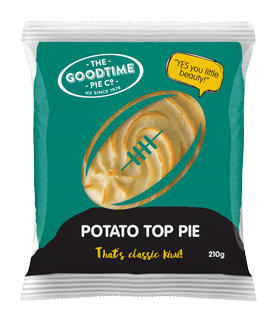 A piping-hot Potato Top Pie straight from the oven has got a bit of a kick. 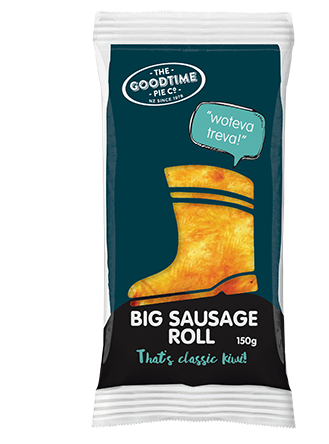 A great big kick in fact. A great big, last minute, “YES you little beauty”, right between the posts to win the World Cup sort of kick. 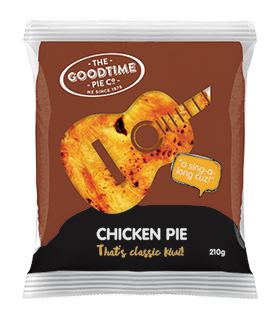 What Kiwi get together would be complete without a guitar and the words “Da da da ba du da da ba du…” Just throw in a couple of cold ones, a shed load of hot Chicken Pies, and Bob’s your uncle – you’ve got “a sing- a-long cuz”. Everyone wears jandals, not fancy footwear, in sunny Hawke’s Bay where we have our HQ. 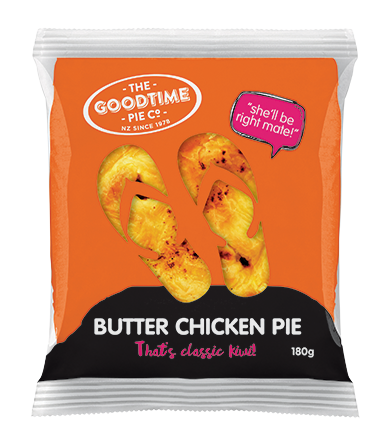 However when we’re baking our pies it’s white gummies and funny hats mate, no “she’ll be right” when it comes to quality and definitely no “she’ll be right” when it comes to our Butter Chicken Pies which have to be the best. New Zealand has over 14,000 km of coastline… no wonder we all love “weekends at the beach”. 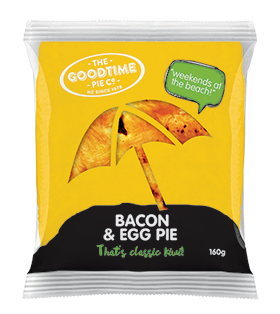 Wearing our budgie smugglers, playing cricket, surfing, chilling under the brolly and when it’s time for lunch brushing the sand off your Bacon and Egg Pie. 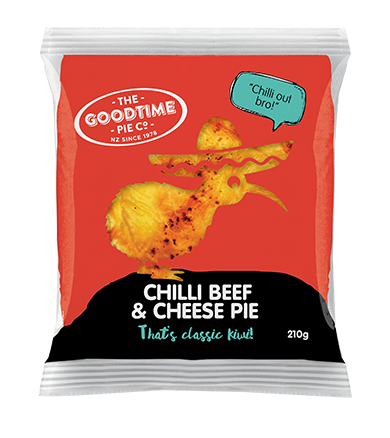 Who needs to go to Mexico to get some spice in your life, just tuck into a few Chilli Beef and Cheese Pies, and watch things quickly heat up! Chilli out bro, kiwi style! 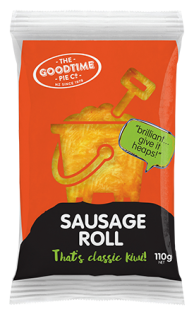 A Sausage Roll with tom sauce is just the ticket. 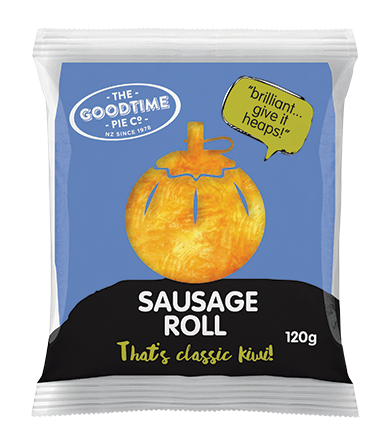 “Brilliant” you cry – “give it heaps”, as you tuck into a Classic Kiwi favourite. 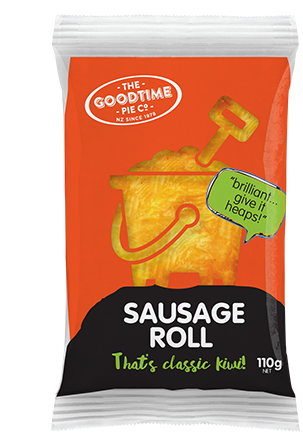 It’s ‘Kiwi As’ building sandcastles on the beach – until you get bored and start burying your Dad instead. 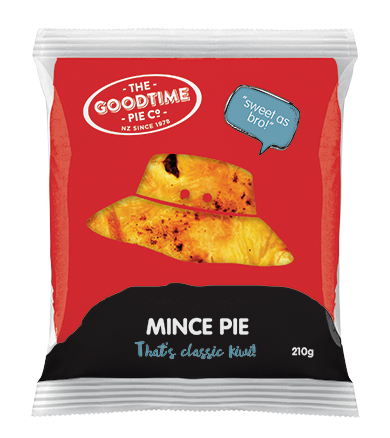 He’s all “yeah, brilliant… give it heaps!”… until the tide starts coming in! 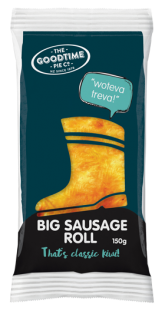 Wellies, billy boots, top boots, Alaskan Sneakers… “Woteva Treva”! 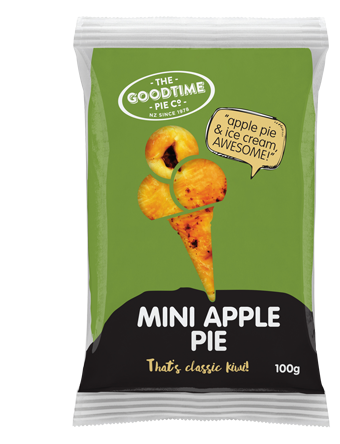 They’ll always be gumboots to us Kiwis. Wear them with everything from stubbies to tuxedos, but always accessorise with a BIG sausage roll.